Rhinos are very dangerous, and they are often bad tempered, charging at anything that moves. This is due to their poor eyesight. So I had to be very careful taking photographs of rhinos in Africa. It took many weeks to find the black rhino with its pointy lip and then the white rhino with its square lip. Both are the colour of the mud they like to roll in. When I went to the Ngora Ngora crater I had a close encounter with a mother and her baby. This was very dangerous with the mother protecting her young. In India, I was safer riding on top of an elephant. The mahout guided the elephant through the tall grass so I could photograph and write about the Indian rhino. They are easily recognised with their ‘coat of armour’ skin. 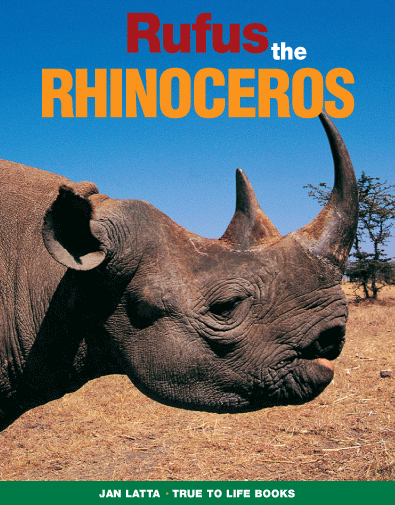 The concept for the book is the rhinoceros talking to children about its life in the wild and how it can survive. There are maps, interesting facts and fun activities.